The Jawa are relatively benign characters from Luke’s home planet of Tatooine. They tend to travel in packs (making for a good group costume) and don’t treat droids too well. They are a very recognizable race from Star Wars- even if you didn’t know their name. They are small- so they are a great costume for the kids. This is a pretty simple costume to pull off. You just need the brown hooded robe, a black mask, and I have seen yellow or red eyes. Here is a great example. Jango Fett is the bounty hunter from Star Wars: Attack of the Clones. He is such a good killer that the storm troopers are “modeled” after him. Jango Fett has a very unique look. He wears the blue “Fett” helmet and uniform complete with jetpack, steel-plating and rusted robotics holding the suit together. Try here for a awesome Jango Fett costume. Bioshock is one of the all-time classic games. 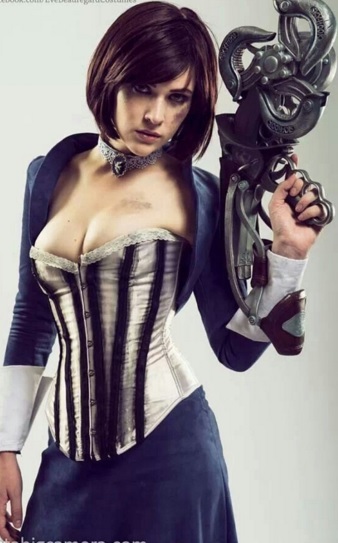 This is a cosplay of Elizabeth- the heroine of Bioshock Infinite the third game in the series. Elizabeth’s look consists of the white corset with blue stripes, blue jacket and blue dress and of course the pendant necklace. You can get Elizabeth’s look here. Modeled by cosplayer Eve Beauregard.